Dublin Business School (DBS) offers a wide range of courses, evening classes, undergraduate, postgraduate and professional degree and masters courses in Dublin. Dublin Business School (DBS) incorporating Portobello College is the largest independent college in Ireland. With over 9,000 students, Dublin Business School (DBS) provides a range of full-time and part-time undergraduate and postgraduate programmes. The college’s undergraduate and part-time degrees are recognised by QQI (Quality and Qualifications Ireland). Dublin Business School offers courses in Business, Arts, IT, Law and Psychology. Courses in Psychology & Social Science, Professional Accountancy, Media & Journalism, Marketing & Event Management, Law, Information Technology, Counselling & Psychotherapy, Business & Management, Arts, Accounting & Finance. 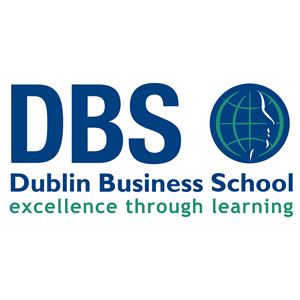 Dublin Business School (DBS) provides career-focused business and law courses as well as the delivery of contemporary course programmes in the areas of arts, media, social science, humanities and psychology. At DBS we will do all that we can to help you to make the right choices for your future and a programme of study at DBS will give you the best possible start in your career. Dublin Business School (DBS) has built a considerable reputation for the quality of its courses and evening classes. As a college, we focus our main research activity on the constant improvement of our courses and learning experience of our students. Evidence of the success we have achieved has come in many different ways. One particular example is the success achieved by our students in the examinations of the professional accountancy bodies where over 880 Dublin Business School students enrolled on our accountancy courses have achieved worldwide and national individual prizewinner success. View the list of evening classes and courses run at Dublin Business School DBS by looking below in the Nightcourses.com Course Finder or contact us with the details below. ACCA Courses Dublin. Association of Chartered Certified Accountants. Dublin Business School is a Platinum Approved Learning Partner, the ACCA’s highest status of tuition provider recognition. This status recognises our commitment to quality of teaching, high standard student facilities, supportive customer service staff and successful pass rates which consistently meet or exceed ACCA’s worldwide pass rates. As our working environment becomes more dynamic and volatile Dublin Business School are now offering this Advanced course in Project Management. Designed specifically for project managers, team members and senior management who in addition to obtaining an Advanced Diploma in Project Management are also prepared to take the Project Management Institute’s PMP exam. The BA (Hons) in Business Studies (Management) degree programme has been designed to provide a broad foundation in business management and in the main functional areas of management. Students are equipped with a wide range of knowledge and skills necessary for a successful career in business. The BA (Hons) Business Management (Project Management) degree programme incorporates a balanced mix of specialised business management modules, aimed at students who whilst wishing to study for a general business management degree choose to focus especially on Project Management throughout the duration of their studies. The BA (Hons) Business Information Systems degree programme recognises the critical role and importance of information technology at all levels in modern organisations. Students are exposed to systems analysis and design, database development, programming, web design and network management techniques. The BA (Hons) Business Information Systems with Cloud Computing is intended to educate and prepare students for employment in information systems or cloud computing. It will also provide students with a strong IT/IS knowledge, competence and skills in the technologies that underpin cloud computing. This degree recognises the critical role and importance of information technology at all levels in modern organisations. Students are exposed to systems analysis and design, database development, programming, project management and systems management techniques. This degree incorporates a balanced mix of specialised marketing modules geared towards the needs of marketing personal operating in a dynamic national and international environment. Flexible degree with options to specialise. This honours degree programme incorporates a balanced mix of specialised marketing modules and event management modules geared towards the needs of marketing personal operating in a dynamic national or international environment. Psychology is one of the most exciting and interesting subjects available in third-level education. It is the study of human behaviour in all its forms, normal and abnormal, natural and learned, productive and destructive. The Bachelor of Laws (Hons) degree provides a firm foundation for students seeking to train as solicitors or barristers. The course provides an insight programme for those are interested in the field of addiction, those involved in addiction service provision, those hoping to work in this area or those whose work or social circumstances brings them into contact with problems of addiction. This course gives students a practical introduction to the burgeoning area of alternative dispute resolution (ADR). The course will cover the main areas of ADR namely, arbitration and mediation. Particular attention will be paid to mediation as a form of dispute resolution. This Diploma develops practical competencies across a range of personnel activities and ensures an understanding of modern HR theory and practice. This Diploma is designed primarily for those who wish to obtain a foundation knowledge in the core principles of Law. It is intended to provide an understanding of the law principles of contract, tort, criminal, constitutional, property, and company law issues. Through this foundation programme, students will obtain an introduction to marketing and promotional methods used in industry. This hugely popular introductory course is also an ideal foundation for further studies on any of the business programmes within the College. The Diploma in Marketing, Advertising, Sales and Public Relations provides students with an introduction to marketing and promotional methods used in industry. On completion of this programme students should have a firm grounding in subject areas such as Marketing Theory & Practice, Advertising, Sales & Sales Management and Public Relations. Those working in or managing a busy office environment are involved in and responsible for a wide range of activities. Their responsibilities include determining policy, setting targets and budgets, employing and controlling staff and ensuring that the highest level of service is provided to customers and other departments within the organisation. This Diploma introduces a wide range of tools and techniques necessary to explore the various processes involved in managing the project life cycle from initiation, planning, execution, control and close-out. We will also explore the social, organisational, behavioural, and systems issues of project management and the course will ultimately provide a framework for managing projects. This programme is aimed towards either the new salesperson who wishes to gain the fundemental skilll of selling or the more experienced sales peron who wishes to improve their professionalism. The Diploma in Taxation is based around Tax Magic, the best-selling book by Alan Moore who is widely known for his regular articles in The Sunday Business Post. Alan Moore will expertly guide students through the various taxes and shown the various tips that can save you money, and traps that can cost you money. This course aims to provide students with the skills necessary to design a website from the ground up. Skills to design & develop a website. Higher Certificate programmes at DBS have a very practical focus and are ideal for students who prefer to ‘learn by doing’. From the major multinationals to the local corner shops, identifying customers and meeting their needs is critical to business survival and success. For many, this makes marketing a particularly attractive and interesting career path. Psychoanalysis is the study of the hidden and unconscious processes of the mind. Explores the way people give meaning to their lives, especially when suffering psychological distress. For graduates of any area who wish to progress into psychoanalysis. This course is a conversion course for non-business degree graduates, who are interested in pursuing a career in business or who wish to develop signicifant business knowledge. For Graduates of any area who wish to pursue counselling & psychotherapy this programme will provide students with a broad graduate-level education and grounding in the theory and practice of counselling and therapy. The MA in Addiction Studies is a formal exploration of addictions from a variety of academic and scientific perspectives: sociological, cultural, psychological, anthropological, and psychoanalytic. The programme is concerned with how these perspectives interact and how they differ from each other. The MA in Psychoanalytic Psychotherapy at DBS School of Arts is designed for graduates who hold a primary degree in which psychoanalysis was a major subject. The MA is aimed at graduates from programmes related to psychotherapy and seeks to meet the needs of individuals who wish to train as professional Psychotherapists. The course conisits of Personal Psychotherapy, Weekly Process Groups, Supervised Clinical Counselling or Psychotherapy Practice and Theoretical components. The aim of this programme is to provide students with a firm grounding in subject areas such as Strategic Marketing Practice, International Marketing Communications, Services Marketing and Interactive Communications and E-Commerce.A wide range of teaching techniques including lectures, videos, workshops, seminars and case studies will form an integral part of the course.